It’s important for a transportation management solution (TMS) to offer flexibility in the way that you create and manage accounts receivable (AR) to ensure accurate billing and fast payment. But even the best AR management capabilities are heavily reliant on comprehensive rating capabilities to allow you to bill your customers in a way that is mutually advantageous to both you and your clients. The sell-side rating methods supported by a TMS solution can easily become a differentiator for a logistics service provider (LSP) and has the potential to decrease maintenance and overhead associated with contract management. Nearly every TMS can support sell-side rates based on contracts or markups, but how extensive and flexible are these methods? A modern TMS will provide you with the opportunity to establish a comprehensive pricing program that’s scalable for your business and meets the diverse requirements of your customers. Does your TMS support these pricing programs for customer billing? Billing contracts should provide for extensive qualifiers and constraints, including rates that can be tiered based on any combination of factors like weight, volume, density and distance, as well as billing contract rates based on a custom format. Blanket vs client-specific can be established as specific for an individual client, a group of clients or may be established as “blanket” pricing that can be applied for all clients. “Generic” billing contracts are non-carrier specific billing rates. Regardless of which carrier is used to move the freight, these “generic” billing rates apply. 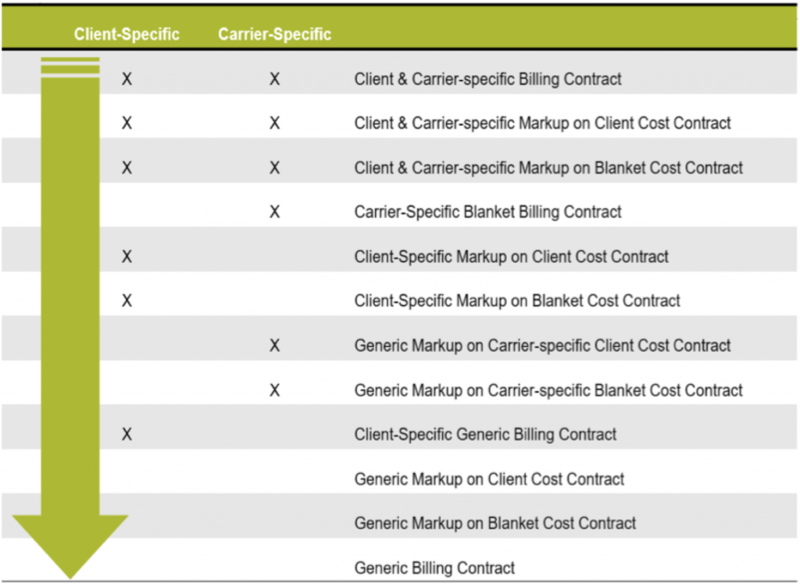 Like carrier-specific billing contracts, these contracts can be established for an individual client or group of clients or may be established as “blanket” pricing that can be applied for all clients. Perhaps you manage your customer’s pricing through a loyalty or incentive program whereby customer pricing will increase or decrease based on the customer “tier” (i.e., platinum, gold, silver, bronze). With tiered blanket pricing, as a customer moves from tier to tier, their pricing level can be automatically adjusted without cumbersome rate maintenance or comprising the accuracy of rating historical shipments. Client vs carrier vs generic: Any combination of client-specific, carrier-specific, both or neither. Minimum markup amount: To ensure minimum profitability is achieved on every shipment, a minimum markup amount can be applied. Apply to accessorials: The standard markup percentage can be applied to accessorial charges as well as freight, or not. Alternatively, specific accessorial charges may be exempt from markup and passed through to the customer; or may be marked up by a percentage that is different than the freight charges. Tiered markup based on weight: Lower weight shipments may be marked up by a higher percentage with a higher minimum charge while large shipments may be marked up less. Gainshare markup allows you to negotiate or publish a benchmark rate for each lane. If you can move the freight at a rate that is lower than the benchmark rate the “savings” between the benchmark and actual cost is split between you and your customer. The cost is then marked up by the gainshare savings that you are retaining. The customer pays the cost plus your share of the savings. Savings or profit sharing allows you to offer an incentive to your customers for consolidating their freight with other customers’. You can define whether you wish to share either profit or savings; the minimum guaranteed profit or savings that is retained by your company; and set a maximum eligible percentage for each client that participates in the program. The eligible savings/profit pool for each load is then distributed amongst each participating client. Their share of the savings/profit is issued as a rebate or discount, against their otherwise standard billing rate for the lane. Savings rebates can be deducted with each transaction or calculated and stored for reporting and periodic rebate program management. With so many rating options, how would you know what the “right” rate is for each lane? That’s why it’s important for your TMS to have a well-defined rate hierarchy to be used as the “tiebreaker” for selecting the right rate. Its capabilities matter little if you can’t bill your customers according to the realities of your business. As you can see, there are a lot of options for billing your customers. A TMS should not force you into a single rating method for a client. It should give you the flexibility to choose the rating strategy that works best in each case to allow you to better serve your customer and remain competitive…and profitable. Dawn Salvucci-Favier is responsible for product lifecycle and strategy management and brings more than 22 years of transportation management industry knowledge to 3GTMS. 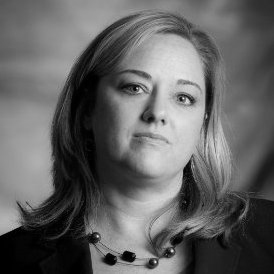 Dawn joins 3GTMS from RedPrairie where she was senior vice president and general manager for RedPrairie On-Demand, and was most recently vice president of global strategy developing the company’s global go-to-market strategy for their Transportation Management solution. Prior to RedPrairie, Dawn was president & COO at Shippers Commonwealth Llc, where she had full P&L management responsibilities for the $6 million, value-added service provider of logistics solutions. She was previously at JDA where her roles included vice president of transportation and logistics solutions; and Manugistcs Inc. Dawn brings extensive 3PL and shipper experience having directed logistics services for NFI Interactive Logistics, and working within the transportation management function at Staples, Inc. and TJ Maxx/The Marmaxx Group.